An Atlanta native, Christian Waggoner brings a fresh new look to the world of Star Wars fine art. His uniquely enhanced photo-realistic style makes viewer wonder how he achieves such skillful detail with a mere brush and canvas. He has gained prestige and success through more than a decade of high-profile commissions including impressive paintings of athletes for the 1996 Olympic Games in Atlanta as well as this and future exciting new releases for the Star Wars fine art program. 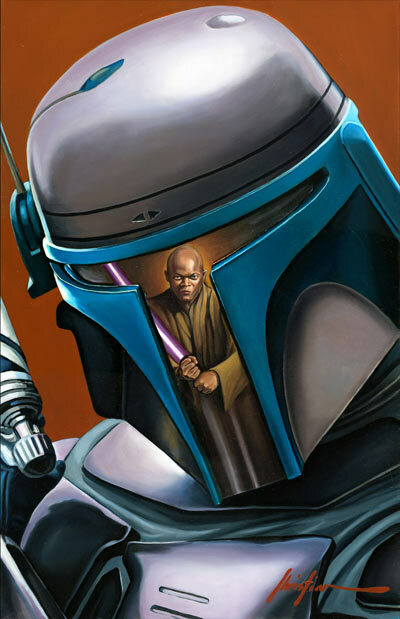 “Jango Fett” is an exploration of light and reflection which captures this unforgettable moment in the classic film from an entirely new perspective.